With only six weeks to go until the Ras Al Khaimah Challenge Tour grand final, Al Hamra Golf Club are pulling out all the stops. This is to ensure players and fans are treated to a top-class golfing experience in the northern emirate as the club hosts the European Challenge Tour’s season-ending tournament for the first time. Having previously hosted the penultimate event on the calendar since 2016, Al Hamra Golf Club will go one better this year with the top 45 players on the European Challenge Tour descending to the club from October 31 to November 3 as they aim to seal a coveted European Tour card for next season by finishing in the top 15 of the Road to Ras Al Khaimah rankings in the Challenge Tour’s season finale. The stunning par 72 championship golf course, which measures 7,325 yards at full length, meanders around four inter-connected open water lagoons merging seamlessly with the water of the Arabian Gulf and is designed by world renowned golf course architect Peter Harradine. In preparation for the season-ending event, Harradine visited the course in June and it was agreed that the course had strayed from its original design since opening in 2007. Following Harradine’s visit, Al Hamra staff have been working tirelessly on the South African’s recommendations to get the course in the best possible shape. Alex McDowell (l) and Graeme MacNiven inspect the course. All 40 course bunkers have been renovated; fairway contours reinstated, tee complexes realigned and greens expanded to present players with a stern but fair challenge ahead of the first tee time on October 31. 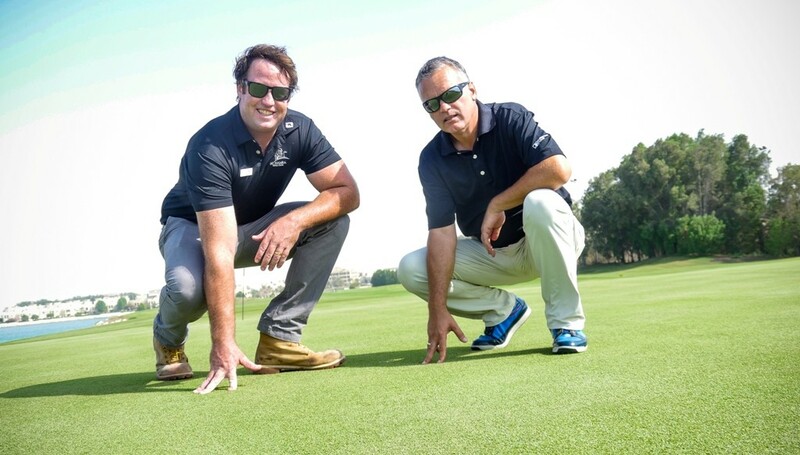 “The team at Al Hamra Golf Club has worked relentlessly throughout the extreme climatic conditions of summer to drastically improve the overall conditions of this beautiful golf course,” said Troon Golf’s Alex McDowell, whose team maintains the course. “We have invested a lot of time restoring all the bunkers to their original design by removing vast amounts of turf encroachment. “In return, we now have larger, more intimidating bunkers that dramatically add to the aesthetics of each hole and are now a true reflection of Peter Harradine’s design. There will be plenty to do for all the family at the grand final with a bustling Championship Village which promises to offer a variety of activities open for all ages as well as plenty of food and beverage outlets to keep visitors fed and hydrated whilst taking a break from the action. Course architect Harradine said: “The vision of HH Sheikh Saud bin Saqr Al-Qasimi, ruler of Ras Al Khaimah, has largely been rewarded as an uninteresting piece of land, previously soaked by sea water during high tide, has been transformed in to a golf course of a standard that is capable of holding an international PGA tournament. Liam Johnston sealed his spot in the season-ending Ras Al Khaimah Challenge Tour grand final. 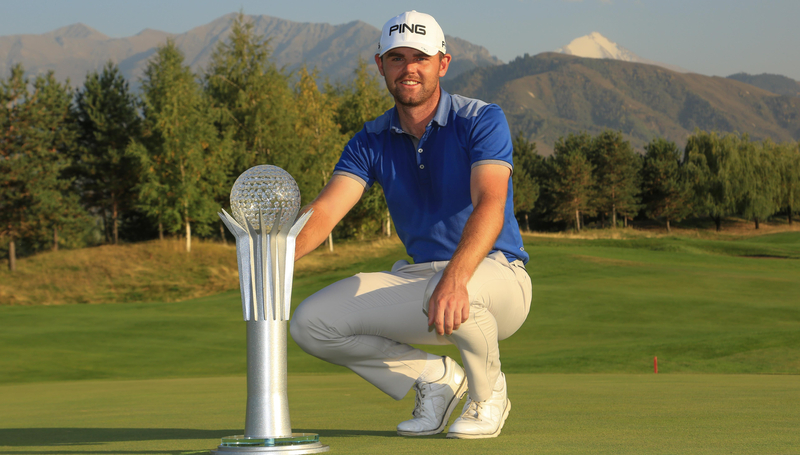 Scotsman Liam Johnston emphatically sealed his spot in the season-ending Ras Al Khaimah Challenge Tour grand final after picking up his second European Challenge Tour win of the season at the Kazakhstan Open presented by ERG. The 25-year-old began the final round one shot back from leader Sean Crocker and dropped a shot on his opening to fall further behind. But Johnston bounced back immediately with a birdie on the next before picking up four more shots on the front nine including a sublime eagle at the par 5 ninth to take the outright lead. One more birdie and eights pars followed on the back nine and despite a late charge from England’s Tom Murray, who ultimately finished in second place, Johnston secured a two-stroke victory at Zhailjau Golf Resort. The Ras Al Khaimah Challenge Tour grand final is now only six weeks away and the top 45 players on the Road to Ras Al Khaimah rankings will go head-to-head at Al Hamra Golf Club from Wednesday, October 31 to Saturday November 3, in a bid to secure one of the 15 coveted European Tour cards available for next season. 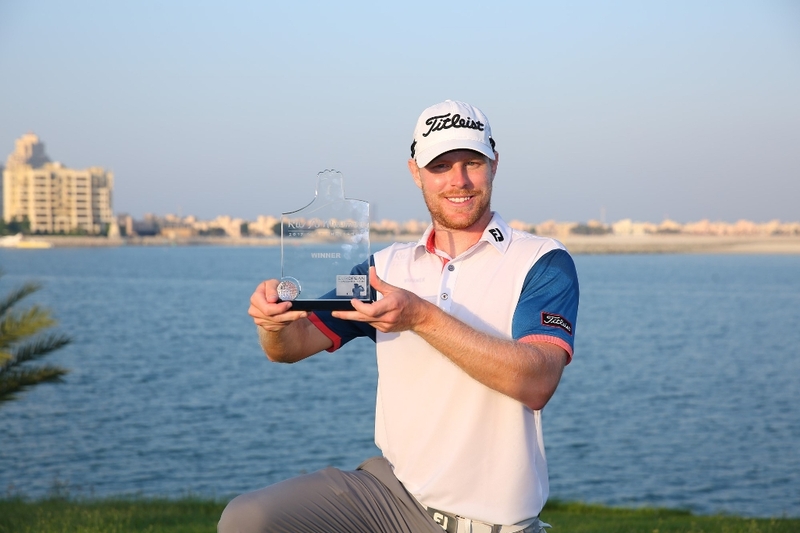 As well as sealing his spot in Ras Al Khaimah, Johnston has all but sealed his European Tour playing privileges for next season after collecting 72,000 Road to Ras Al Khaimah points which moves him from 40th to fourth in the rankings. Johnston, who won the Andalucia – Costa del Sol Match Play 9 earlier this season, came into the season without any expectations after having to rely on invites to get into events. “I started the season with no category at all, and was just playing off invites,” said Johnston. “That first win was huge for me in taking the step onto the Challenge Tour and it seems like this one’s going to be a huge win in taking a step onto the European Tour. 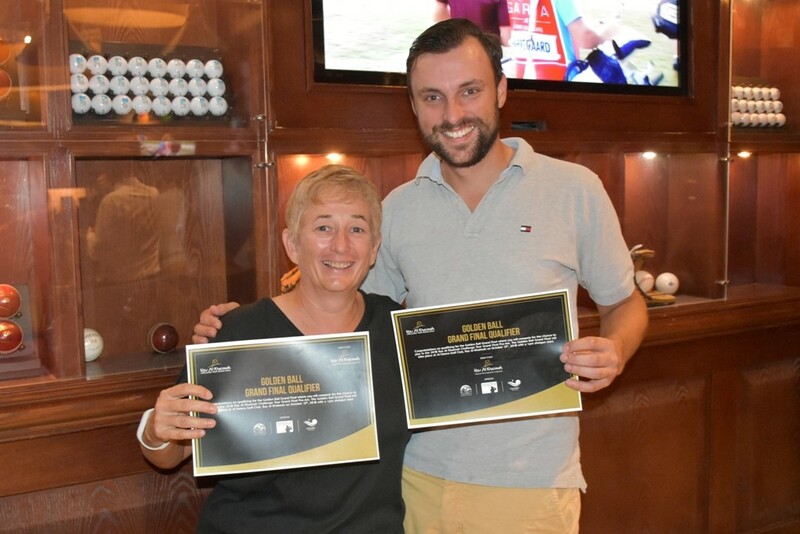 Simon Higginbottom, Ras Al Khaimah Challenge Tour grand final tournament director, added his congratulations, saying: “Congratulations to Liam on his second win of the season at the Kazakhstan Open. “To win at one the flagship events on the Challenge Tour is a fantastic achievement and one that has put Liam fourth in the rankings and in prime position to secure a European Tour Card next season by finishing in the top 15. Murray’s magical final round 65 saw him finish in second place and pick up 49,000 points. The Englishman jumps from 45th to 11th in the rankings which secures his spot in the grand final. Another significant mover in the rankings was American Crocker who finished tied for third. Crocker moves up to 32nd from 79th and is now on the brink of qualification. The Challenge Tour now travels to Mallemort, France, for the Hopps Open de Provence, which will be the 24th event on the Road to Ras Al Khaimah. With only four tournaments remaining before the Ras Al Khaimah Challenge Tour Grand Final, and significant moves made in the rankings by the likes of Johnston and Murray, the competition is set to turn red-hot down the home stretch. Jens Dantrop won last year's Ras Al Khaimah Golf Challenge and went on to gain promotion to the European Tour. The hotly anticipated 2018 Golden Ball Series is under way, and this time, for the UAE’s amateur golfers, the stakes are even higher as they compete for a place alongside the stars of the European Challenge Tour in Ras Al Khaimah. After two successful editions in 2016 and 2017, the Challenge Tour event in RAK has this year been promoted and is now the climax to the season. 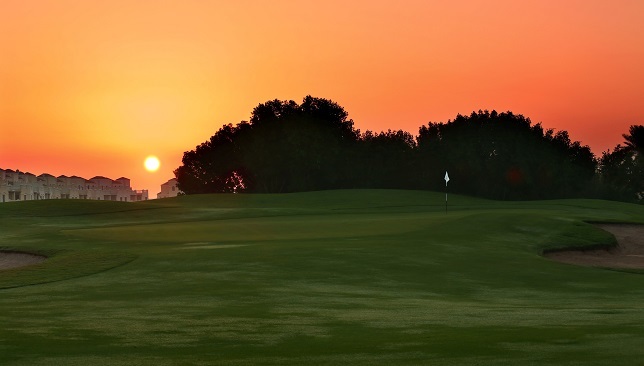 The Ras Al Khaimah Challenge Tour grand final will take place at the stunning Peter Harradine designed Al Hamra Golf Club from October 31 to November 3, where the top 45 players on the Road to Ras Al Khaimah will cross swords. At the conclusion of the event, the top 15 players on the rankings will gain a life-changing promotion to play on the European Tour next season. Golfers in the UAE are being given the chance to get their hands on a coveted ‘Golden Ball’ which will gain them entry into the Pro-Am taking place on Monday, October 29, where they will rub shoulders with golf’s next generation of superstars. Among those to have come through the European Challenge Tour ranks are three-time major champion Brooks Koepka, reigning Race to Dubai champion Tommy Fleetwood as well as Ryder Cup and major winning stars Justin Rose, Henrik Stenson and Martin Kaymer to name just a few. More recently, Jordan Smith won the inaugural 2016 Challenge Tour event in Ras Al Khaimah to confirm his status as that season’s Challenge Tour number one, setting the Englishman on a pathway to success which saw him claim his maiden European Tour title at last season’s Porsche European Open. Wouter Verwaal and Elli Oschmann celebrate becoming the first two qualifiers through to the Golden Ball grand final. Haitham Mattar, CEO of the Ras Al Khaimah Tourism Development Authority, said: “As professional players compete to end the season at the top of the Road to Ras Al Khaimah rankings and gain promotion to the European Tour, the grand final of the Challenge Tour’s Road to Ras Al Khaimah is a prestigious event for the UAE. “Sports and adventure tourism are key to Ras Al Khaimah’s tourism development strategy and this tournament is an important addition to our calendar that will inspire more golf enthusiasts to play where the professionals play. “The Golden Ball Series is a wonderful example of this. Local golfers in the UAE compete for a once in a lifetime opportunity of rubbing shoulders with the next generation of professional golf stars on the European Challenge Tour. “The amateurs who make it through the qualifying series and win a spot in the 2018 Ras Al Khaimah Golf Challenge grand final Pro-Am will enjoy an unforgettable experience playing alongside some of the best players. “The championship course managed by Troon and located in the idyllic lifestyle village of Al Hamra will take them around natural lagoons in a stunning setting – allowing them to get a feel for the natural beauty of Ras Al Khaimah. All 21 clubs in the country have been invited to stage a qualifying event for the 2018 series, sanctioned by the Emirates Golf Federation, which will see players battling it out to win a much sought-after spot in the grand final set to take place at Al Hamra Golf Club on Saturday October 13. The first qualifier took place at the weekend at Arabian Ranches Golf Club with 48 participants all vying for a place in October’s grand final. Wouter Verwaal sealed his spot after carding an impressive score of net 68 in the men’s qualifier for a one-stroke triumph over Jonathan Underhill. In the ladies event, Elli Oschmann emphatically booked her place after shooting net 72 which included a memorable hole-in-one on the 17th. The top three finishers from the Grand Final will be treated to a truly unique ‘inside the ropes’ golfing experience when they tee it up alongside the best players on the Challenge Tour ahead of the biggest event of the season.